D1 top team - WO Boufarik (13-0) had no problems winning another game on Sunday. This time they crushed fourteenth ranked Ouargla (2-9) 96-52. Undefeated WO Boufarik have an impressive series of eleven victories in a row. They maintain first place with 13-0 record. Ouargla lost sixth consecutive game. They keep the fourteenth position with nine games lost. Important game to mention about took place in . Thirteenth ranked Rouiba CB (4-9) saved a 1-point victory at home edging 15th ranked AB Skikda (2-11) 75-74 on Sunday evening. Newly promoted Rouiba CB maintains thirteenth place with 4-9 record. AB Skikda lost their third game in a row. AB Skikda at the other side, also newcomer in the league, keeps the fifteenth position with 11 games lost. An interesting game took place in Setif where 6th ranked USM Alger (6-7) was upset on the court of ninth ranked USS (7-7) 73-69 on Sunday. USS moved-up to sixth place. USM Alger lost their fifth game in a row. They dropped to the seventh position with seven games lost. They share it with CRB Dar El-B.. There were no shocking results in the rest of the games of round 13: El Eulma lost to Staoueli on the opponent's court 69-73. NAH Dey outscored Olympi Batna in a home game 91-54. OS Arreridj recorded a loss to CRB Dar El-B. on the road 61-54. GS Petroliers crushed Olympi Miliana on its own court 93-60. USM Blida was beaten by IRB Arreridj in B.B. Arreridj 64-58. D1 top team - WO Boufarik (13-0) had no problems winning another game on Sunday. This time they crushed fourteenth ranked Ouargla (2-9) 96-52. WO Boufarik have an impressive series of eleven victories in a row. They maintain first place with 13-0 record. Ouargla lost sixth consecutive game. They keep the fourteenth position with nine games lost. Very expected game when 12th ranked El Eulma (4-8) was defeated on the road by fifth ranked Staoueli (10-3) 73-69 on Sunday. However just four-point win is not that big difference and the fans of host team counted on more convincing victory. The victory was the seventh consecutive win for Staoueli. They maintain fifth place with 10-3 record. Loser El Eulma keeps the twelfth position with eight games lost. Very predictable result in Alger where second ranked NAH Dey (12-2) smashed bottom-ranked Olympi Batna (2-12) 91-54 on Sunday. NAH Dey maintains second place with 12-2 record behind leader WO Boufarik. Loser Olympi Batna stay at the bottom position with 12 games lost. We cannot really consider it an upset in the game between close teams in El-Beida where 10th ranked OS Arreridj (5-7) was defeated by eleventh ranked CRB Dar El-B. (6-7) 61-54 on Sunday. CRB Dar El-B. moved-up to seventh place, which they share with USM Alger. Loser OS Arreridj dropped to the eleventh position with seven games lost. Everything went according to plan in Alger where fourth ranked GS Petroliers (10-2) outscored 7th ranked Olympi Miliana (6-8) 93-60 on Sunday. 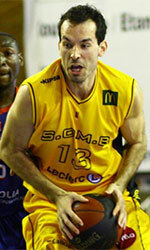 The victory was the tenth consecutive win for GS Petroliers. Defending champion maintains fourth place with 10-2 record. Loser Olympi Miliana dropped to the ninth position with eight games lost. They share it with USM Blida. There was no surprise in B.B. Arreridj where 8th ranked USMB (6-8) was defeated by third ranked IRB Arreridj (11-3) 64-58 on Sunday. However just six-point win is not that big difference and the fans of host team counted on more convincing victory. IRB Arreridj maintains third place with 11-3 record having just one point less than leader WO Boufarik. Loser USMB dropped to the ninth position with eight games lost. They share it with Olympi Miliana.